Sakai Tadatsugu (酒井忠次, 1527-1596), one of the so-called „Four Guardians of the Tokugawa“ (Tokugawa-shitennô, 徳川四天王), was born in Mikawa province and appointed by his lord Tokugawa Ieyasu to castellan of Yoshida (吉田城) in Eiroku eight (永禄, 1565) which was located in the eastern part of Mikawa. The castle town of Yoshida was insofar important as it had via the Toyokawa River access to the sea (Mikawa Bay) and as it was located at the Tôkaidô, the main road which connected Kyôto with the Kantô area. Now whilst ruling Yoshida Castle, Tadatsugu killed – according to transmission – with one of his swords a boar whereupon the katana got the nickname „Inoshishigiri“ (猪切, lit „boar cutter“). The nickname was inlayed via kinzôgan on the tang. The blade came eventually in the possession of Tadatsugu´s fourth son Matsudaira Jinzaburô Hisatsune (松平甚三郎久恒, 1584-1652). When Tadatsugu´s grandson Tadakatsu (酒井忠勝, 1594-1647) became daimyô of the Shônai fief (庄内藩) of Dewa province in Genna eight (元和, 1622), he made his uncle Hisatsune castellan of Kamegasaki (亀ヶ崎城) and later in Kan´ei six (寛永, 1629) his karô elder. The sword remained in Hisatsune´s family, according to transmission until the last karô Matsudaira Jinzaburô Hisaatsu (松平甚三郎久厚, ?-1921). 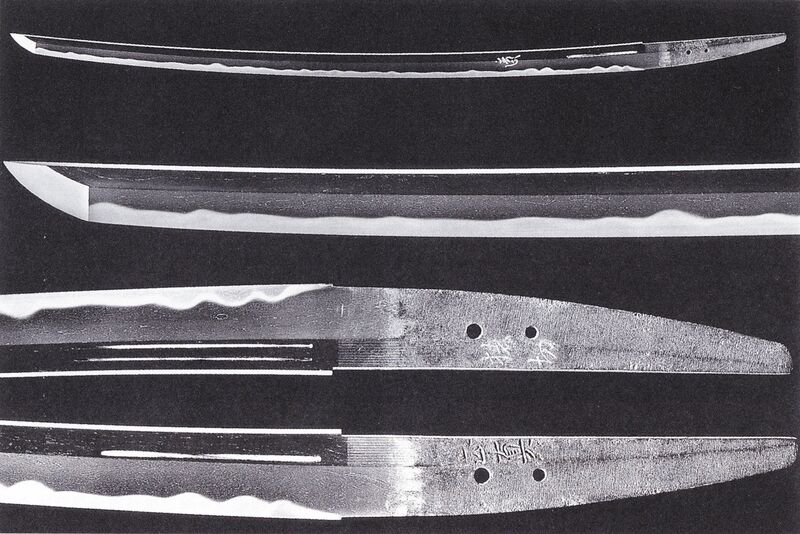 The blade itself is a work of Masazane (正真) on whom I would like to make some observations. It is said that Masazane was a late Tegai smith who lived in the old Fujiwara district (藤原) of Nara in Yamato province. From there he visited Kyôto where he became a student of the Eishô-era (永正, 1504-1521) Heianjô Nagayoshi (平安城長吉) with whom he travelled a lot. Their first destination was Kuwana (桑名) in Ise province where they worked together with Muramasa (村正). Well, it is unknown who actually learned from whom but we can definitely see similarities in the workmanship of Masazane, Nagayoshi and Muramasa. After their stay in Ise they went further eastwards, namely to Mikawa province, and as the Tegai school was also called „Monju school“ (文珠), the lineage of Masazane was later also called „Mikawa-Monju“ (三河文珠). But that was not enough as both travelled along the Tôkaidô up to Odawara (小田原) in Sagami province. This can be confirmed by signatures of Nagayoshi and Masazane which mention „Sôshû-jû“ as place of production. 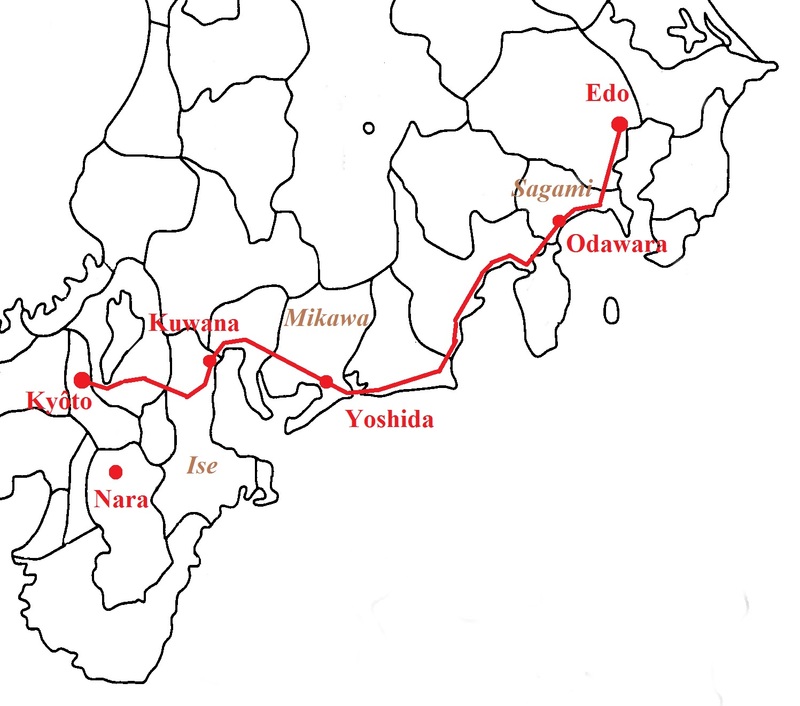 Picture 2: The travels of Masazane and Nagayoshi. In red the Tôkaidô. There is some confusion about the Kanabô smith Masazane of the same name. He was active somewhat later, i.e. around Tenbun (天文, 1532-1555), and was according to transmission the son of the Eishô-era late Tegai Masazane. He did not accompany his supposed father on his journeys but moved later from Fujiwara to the Kanabôtsuji (金房辻) district of Nara which earned the Kanabô school its name and which was later adopted as family name. He signed for example with „Kanabô Hayato no Suke Masazane“ (金房隼人佐正真) and his signatures are clearly different from the earlier Masazane. Also from the point of view of workmanship the theory that the Eishô-era Masazane and Kanabô Masazane were the same person can be dismissed. Around Tenshô (天正, 1573-1592) there was a 2nd generation Kanabô Masazane, presumably the son of the 1st generation. Well, the 1st generation Kanabô Masazane had according to transmission a younger brother who also bore the name „Hayato no Suke“ but wrote his name „Masazane“ with the characters (正実), or in the old and unsimplified form (正實). The latter Masazane was active around Eiroku (永禄, 1558-1570) and his successor of the same name around Keichô (慶長, 1596-1615). Picture 3: Signature comparison. 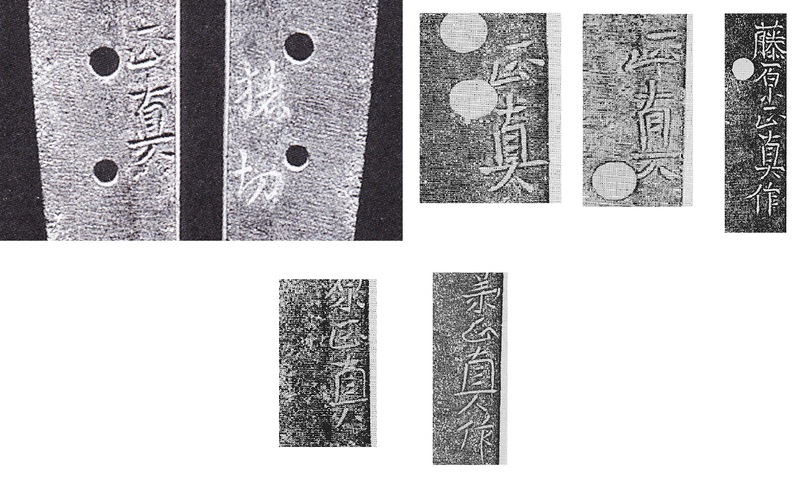 Top row four signatures of the Eishô-era Masazane with the mei of the Inoshishigiri to the left. Bottom row two signatures of Kanabô Masazane. So when Masazane was active around Eishô (永正, 1504-1521) and Sakai Tadatsugu was born in Daiei seven (大永, 1527), it can be ruled out that the latter ordered the blade from Masazane whilst he stayed in Mikawa. Thus the blade must had been in the possession of the Sakai before the time of Tadatsugu. At the time Tadatsugu was born, his father Tadachika (忠親) ruled Ida Castle (井田城) in Mikawa province which was located about 30 km to the northwest of Yoshida and along the Tôkaidô. From Kuwana to Ida is about 80 km. As it is unlikely that Masazane and Nagayoshi traveled with a bunch of blades we can assume that they might had just some presentation pieces to demonstrate local rulers their skill. So maybe Tadachika was impressed by Masazane and ordered the later Inoshishigiri from him. If this was the case, then the blade was forged at Ida Castle. Incidentally, Tadachika´s father, grandfather and great-grandfather were Yasutada (康忠), Tadakatsu (忠勝) and Ujitada (氏忠, ?-1470) respectively. As the exact dates of Yasutada and Tadakatsu are unknown, it is also possible that the contact to Masazane came about through Tadachika´s father Yasutada or even grandfather Tadakatsu. All of them were castellans of Ida in succession. But I don´t want to leave out the most famous work of Masazane, the yari Tonbôgiri (蜻蛉切). Honda Tadakatsu (本多忠勝, 1548-1610), another Tokugawa-shitennô, wore this yari at the Battle of Hitokotozaka (一言坂の戦い) in Genki three (元亀, 1572) and forced with it his way through the line between the enemy and the allies by wielding it overhead. It has to be mentioned that the shaft of the spear was 6 m long! (The blade itself has a nagasa of 43,8 cm.) According to transmission, once a dragonfly (Jap. tonbô) tried to land on the yari but was cut in two halves and that is why it got the nickname „Tonbôgiri“ (lit. „dragonfly cutter“). You really make it appear so easy together with your presentation but I to find this topic to be actually one thing which I feel I might by no means understand. I’m sorry.I am poor at English.The way of my question may become rude. I am a Japanese studying Masazane. 1.Have you seen Masazanes work which Sagami or Mikawa product ? I am looking for it.If there is the idea including the book which a photograph appears in, please tell me. 2.In Picture 3.Two works which you introduce as a Kanabo are different in the form of the Mei each.And I think that the form of Nakago probably diffarent in right and left.Right Soshu nakago Left Bizen nakago.Do you think that both works are Kanabos? 3.Do you think that his school is which? I think that he is different from the traditional Yamato Den. All of these works are by Sengo Masazane of Ise. The first is by the first generation of circa Eishô and the Tonbo-giri is by the second generation circa Tenbun. Kanabô Masazane is a completely different smith. Yes, Sengo Masazane and Kanabo Masazane were different smiths. Thats why I wrote: “…the theory that the Eishô-era Masazane and Kanabô Masazane were the same person can be dismissed.” The two swords introduced are Sengo Masazane works. I only added two Kanabo Masazane signatures to the signature comparison to show that also his meiburi is differerent from that of the Sengo group.